With the pounding thunk of metal knocking into concrete giving the surrounding neighborhood a good shake, work crews began the process of demolishing the burned-out Marion Apartments building to make way for new construction Friday morning. 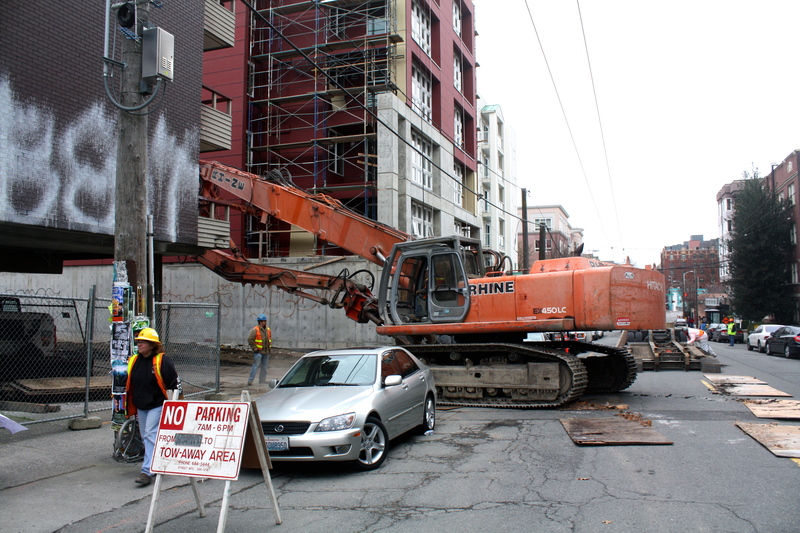 CHS reported last week on the imminent start of work on the project at Bellevue and Pine. The building became a haven for squatters and drug users in the years since a 2008 fire ripped through part of the building as the final tenants were cleared out when the property was first being prepared for redevelopment. 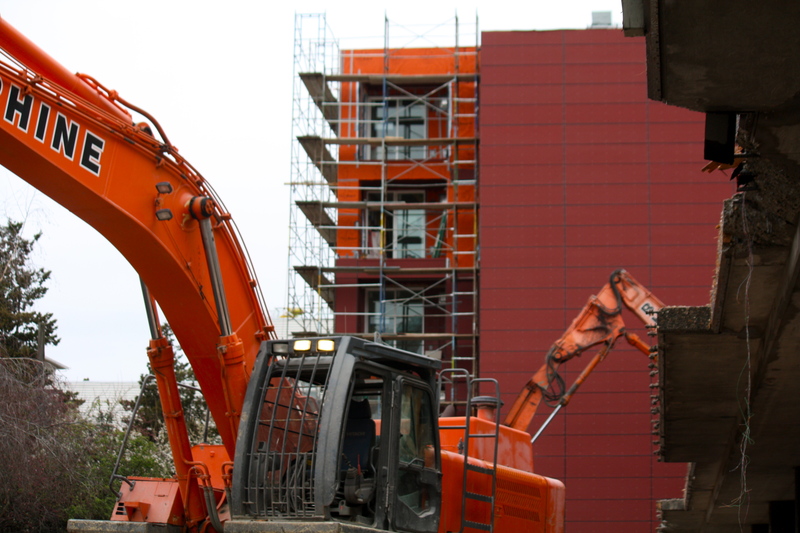 The subsequent economic downturn left the abandoned building in development limbo. You can learn more about the mixed-use building now set to inhabit the corner here. 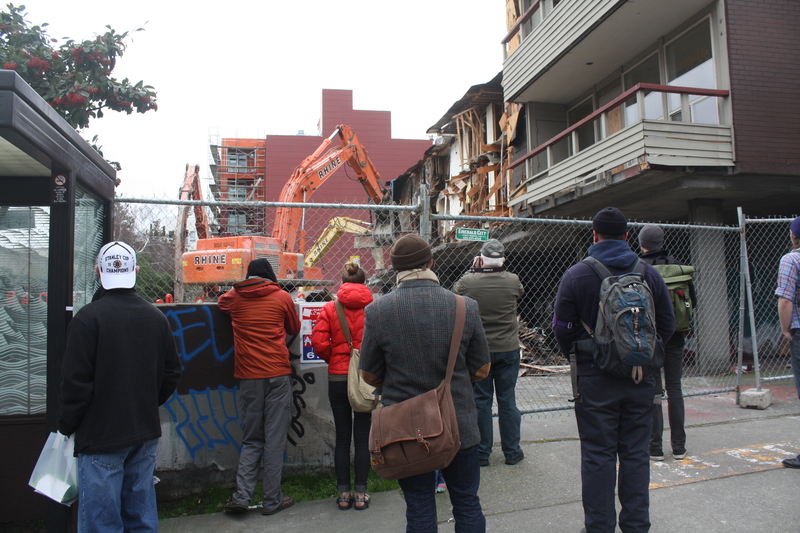 The Bellevue/Pine demolition in a high-traffic pedestrian environment drew a steady stream of onlookers Friday morning. 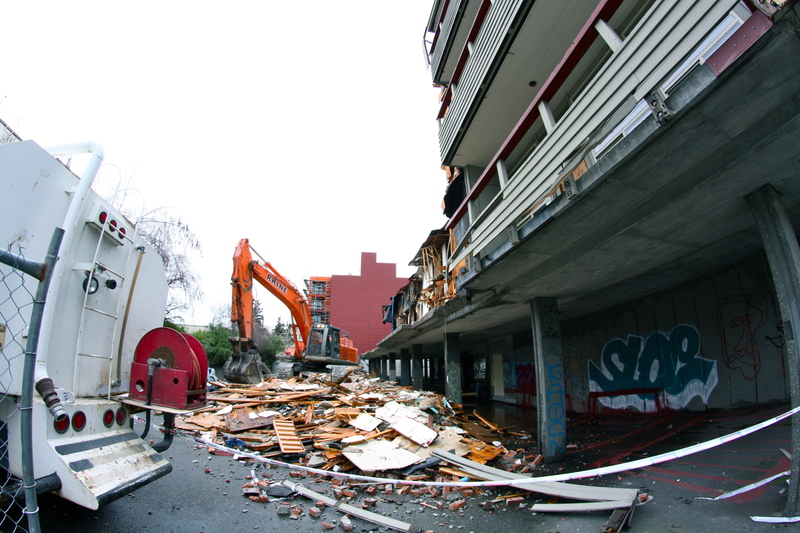 The shaking caused by knocking down the 1960s-era building’s concrete core piece by piece can be heard — and felt — throughout nearby streets. May this beast rest in peace. Feeling the vibrations stories up a few blocks away, yeah. A little disquieting, having been here for Nisqually. Onward and upward, hopefully something much better than a big ugly box than space, but then again pretty much anything is better than the eyesore (and tragedy) had become. May the soul of the man who died in the fire there rest in peace. And maybe the new building will be named in his honor. Why would you name a building (in honor no less) after someone who put many lives in danger by starting a fire? You obviously don’t remember the circumstances. The man who started the fire was the longtime Super of the building and the last to refuse to leave when the Owner was evicting everyone for “demolition” years ago pre-meltdown. Fearing he would be forcibly removed, he started the fire that led to his own death. TOTAL TRAGEDY, especially since there was no rush, in hindsight, for him to leave. Worst story of the crazy hyper inflated market that I can remember. I don’t know if naming the building after him would be right or perverse. Can’t imagine he would be happy about that. Yeah, the old man started the fire and shot himself in the head. Naming the new building after him would be morbid. Glad to see the eyesore finally be put to rest. I wonder where that one homeless man will go who built a mattress fort at the front entrance has gone. It sure took long enough to do something about that shell of a building. It was with great delight that I watched this monster start to come down, and all the while, I heard munchkins celebrating, and singing the refrain from The Wizard of Oz, “Ding Dong, the Witch is Dead!”. For me, this is equal parts demolition and exorcism; this building has some bad vibes. Totally the most awesome demo video I’ve ever seen. Yes, your comments are probably right. My bad. try living above the new Link tunnels. Those work trains cause a 2.5 quake every 15 minutes, 24/7. Kingdome demo was better…give it a look sometime. obvi, Wow. is being sarcastic. did you even watch this video? oh boy, i can’t wait for those new condos! just what the hill needs. let’s see just how straight we can make the hill. oh no! not more nice new living spaces in replacement of condemned/empty buildings that serve as flop houses for meth-heads! newsflash: the gays want to buy condos on the hill, too. Sorry about the unrelated comment, but the Barista at Peet’s on Broadway had the brake cable to her bicycle stolen while she was at work ( the bike was on the rack right next to Peet’s), and she crashed on the way home, and was injured. She is really nice, and I was hoping for an update on her condition, and humbley ask the CH blogists to post her story.